In recent years, we have collaborated with various (inter-)governmental and academic institutions both to promote effective approaches to sustainability challenges and to share our expertise on managing specific risks. In Europe, we increased our engagement activities on the important role insurers play in mitigating climate risk, engaging closely with the European Commission’s work on climate adaptation and risk prevention and participating in several focus groups. To coincide with the European Commission’s work on the role of insurance in climate adaptation, we hosted a high-level conference in Brussels (see below). We also continued to use our trade association memberships (eg in the Reinsurance Advisory Board and Pan European Insurance Forum) to promote our key messages on this topic. In the US, we have maintained regular dialogue with the National Association of Insurance Commissioners (NAIC), principally on climate change and natural catastrophes. For our participation in the Financial Stability Board’s Task Force on Climate-related Financial Disclosures, see Climate risk and sustainability. 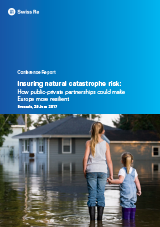 This conference hosted by Swiss Re in Brussels brought together representatives from the insurance industry and the public sector to debate what action is needed to improve how EU citizens are protected from natural disasters. The discussion focused on what kind of natural catastrophe schemes are already successfully in place and what learnings from other regions in the world could be transferred to Europe. As a follow-up to the event, Swiss Re published a conference report to reiterate the event’s key messages and highlight examples of where pre-emptive action to tackle the exposure to natural disasters has helped to reduce the protection gap. with development agencies such as the United States Agency for International Development (USAID), the UK’s Department for International Development (DFID), the Swiss Agency for Development and Cooperation (SDC), the World Bank, the Asian Development Bank (ADB), the Inter-American Development Bank (IADB) and the German Development Bank (KfW). We have regularly contributed to platforms such as the World Economic Forum, B20, G20 and G8 to share our insights on key risks, and support the United Nations Framework Convention on Climate Change (UNFCCC) process. Through the Swiss Re Institute, we build and manage partnerships with worldclass academic and research institutions (see The Swiss Re Institute), guide Swiss Re’s internal capital allocation and business steering processes and provide our stakeholders with cutting-edge risk research.